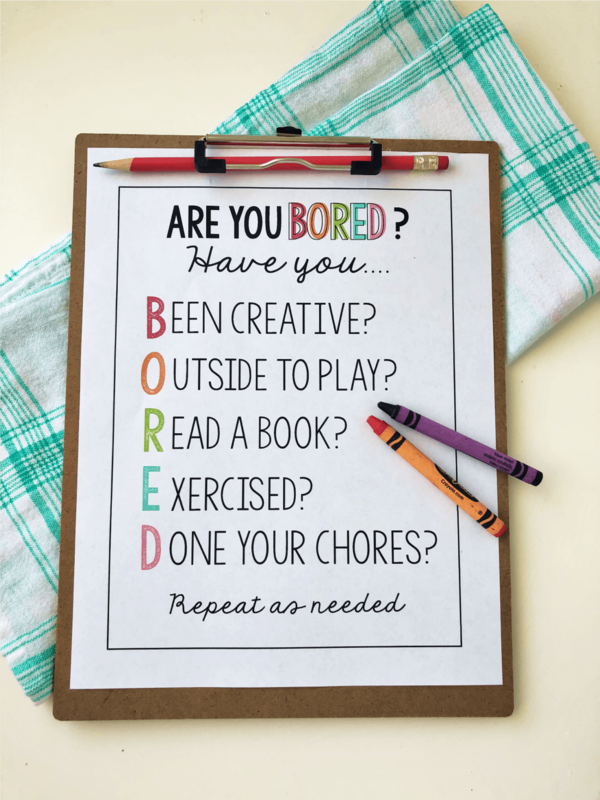 Cut the “I’m booooooored” down with this printable – it spells out things to do when bored pretty clearly! 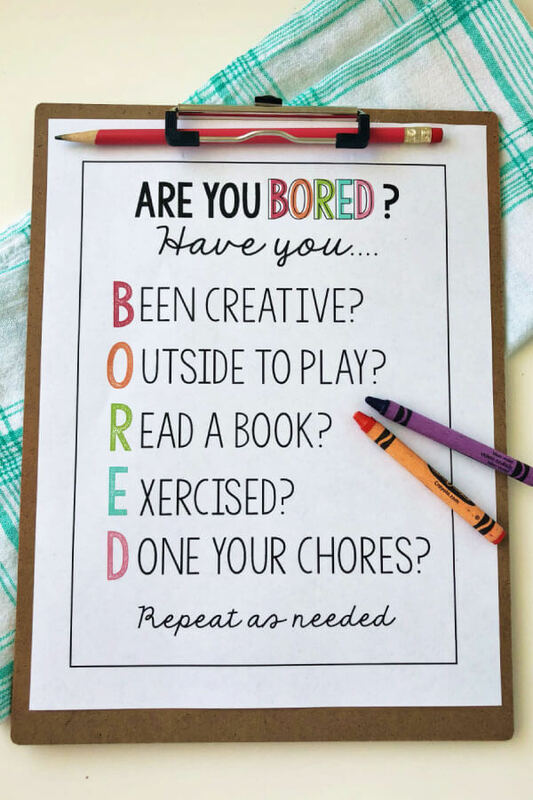 Throughout the school year we are so busy with all kinds of activities that my kids rarely have time to be bored. But summer hits and all of the sudden they get bored pretty quickly. With a whole lot more down time, they look to be entertained. But I’m on a mission to make sure that they can be independent and get things done. This printable spells it out pretty clearly – kids can get creative, play outside, read, exercise and/or do chores. I can often be heard saying “If you’re bored I can give you some work to do!” They have caught on that they need to find something to do so that I’m not constantly trying to entertain them. I know that each child is different – some kids are really independent naturally, while others need more attention. But giving them boundaries, guidelines and expectations not only helps cut down on boredom, but helps them. Summer Activities for Kids– this has TONS of fun ideas to do! 20 Slime Recipes for Summer– slime is all the rage. Here’s a big ol’ list to tackle! Self Serve Snacks for Kids– kids often eat when they are bored. Setting up healthy snacks for kids will help with this! Get an editable version of this printable as a part of my Summer Bundle! 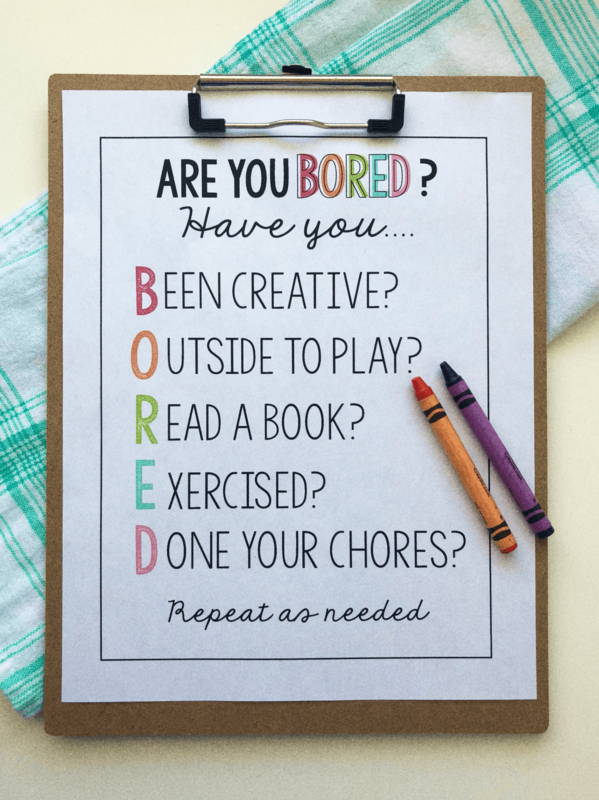 Download this printable “Are you bored?” sheet. For personal use only.